Regardless of conversation type, Re:amaze utilizes a consistent user interface to help you respond to conversations and messages quickly, efficiently, and in a well-organized fashion. Use the quick actions menu for contextual conversation actions such as reply, resolve, mark as spam, run workflow, reassign, and much more. These commands change depending on the type of conversation. Look to the conversation meta data to get at-a-glance information about a particular conversation including its subject line, conversation state, the channel and brand it belongs to, its reference ID if applicable, who it's assigned to, and what tags have been added to the conversation. Find out more details about a the particular customer that started this conversation under the custom field and data attributes panel. Custom fields are automatically injected based on the custom fields you have enabled in the Re:amaze Shoutbox widget. Data attributes are added to the customer's profile either manually or programmatically. Speak with your integration representative about this. The conversation message thread is displayed in chronological order with oldest message on top and newest message at the bottom. 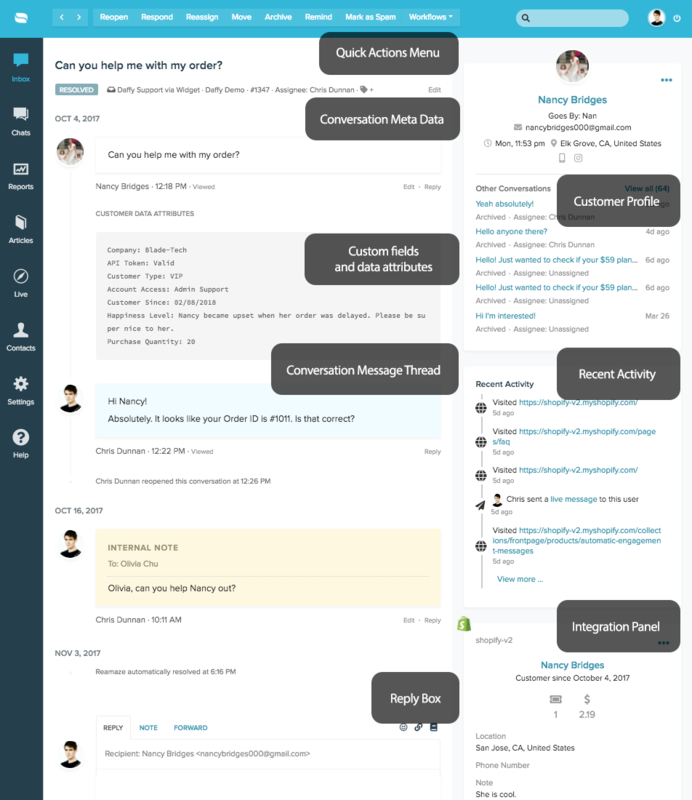 The message thread also shows whether the customer has viewed your reply and if your teammates have viewed a customer's reply. Other information included here are event data for whenever someone resolves, reopens, reassigns, or archives the particular conversation. The reply box is where you'll craft your reply to customers, where you'll leave internal notes to other staff members, or forward the conversation to a 3rd party. These specific actions are represented by their own tab. You can also choose to use the emoji picker, the "insert FAQ article hyperlink", or the "insert response template" features. To learn more about response templates, go to "Settings" >> "Advanced Features" >> "Response Templates". The customer profile panel displays information about the customer including his or her full name, goes-by name (or short name), their primary contact identity, other contact identities such as their phone number or social media account, their time zone, their location, and their conversation history. The customer profile can be edited by clicking on the customer's name. The recent activity panel is only enabled if you have the Re:amaze Shoutbox/Chatbox widget embedded inside your website or app. It shows you where the customer is currently and where they've been. To learn more about this feature, see this article. And lastly, the integration panel is home to all enabled Re:amaze integrations including Shopify, BigCommerce, MailChimp, Stripe, Shipstation, GitHub, and the custom module.